Medical cannabis advocates and state business leaders have been reviewing 300-plus pages of potential legislation that would establish a regulatory framework for medicinal marijuana — and address concerns from employer groups — should State Question 788 pass on June 26. 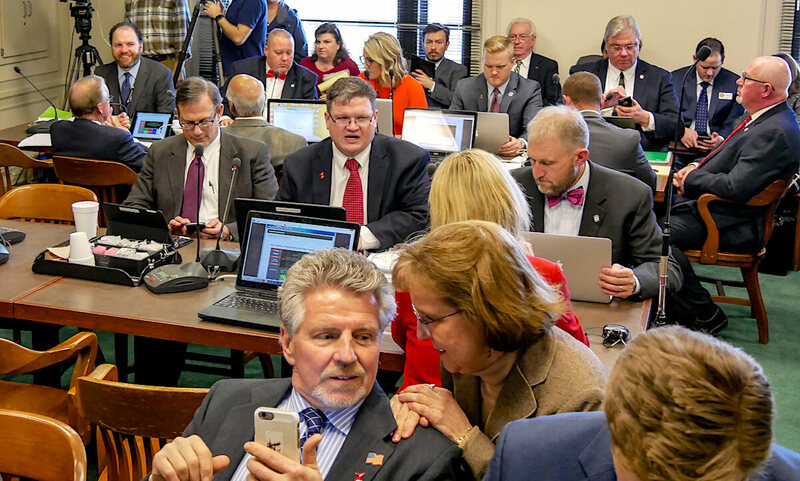 But whether the Legislature will consider the comprehensive proposal before adjourning sine die (as early as Friday, May 4) remains to be seen, with House GOP leadership supporting action yet saying the Senate appears less interested. Those supportive of the proposed regulatory framework — both medical cannabis proponents and business groups — are concerned that the Senate may oppose taking action. Asked Thursday about the situation, Senate President Pro Temp Mike Schulz (R-Altus) said he has formed an informal working group of about a half-dozen senators “who have had an interest already” in the issue. Schulz said he has not received the new medical cannabis regulatory framework proposal, which was drafted by Bud Scott, an attorney and the executive director of New Health Solutions Oklahoma. Scott said he believes the Legislature should pass the framework this session ahead of the June 26 vote. Scott’s group is a trade association for the budding medical cannabis industry in Oklahoma, and he said he has been working with parties across the spectrum to achieve proper regulation. While Scott, Berry, Echols and others acknowledge their efforts face a time crunch as the 2018 regular session wraps up, passage of SQ 788 without prior creation of a robust regulatory framework could spawn three words bound to raise blood pressure throughout the Capitol: third special session. Rep. Emily Virgin (D-Norman) said medical cannabis can ultimately help people and that lawmakers should ensure a safe and responsible regulatory environment for their constituents. “If we do not address something prior to this legislative session adjourning, then we absolutely have to come back into special session to pass comprehensive regulations for the medical cannabis program,” he said. Will chambers of commerce oppose SQ 788? While the Oklahoma State Chamber has interest in the Legislature addressing the statutory issues it has raised about SQ 788, some proponents of the ballot measure worry that failure to advance the regulatory framework will result in one or more chambers of commerce spending money against the state question. Virgin said she supports legislative action on Scott’s medical cannabis regulations this session. Earlier in session, Rep. John Paul Jordan (R-Yukon) had carried his own regulatory framework bill — a mild 186 pages by comparison — that ultimately stalled. While he said the late timing of Scott’s proposal could be problematic, Jordan believes doing something proactive would be preferable to waiting and seeing. “It’s a lot easier to put the saddle on the horse before it’s out of the barn and out in the field,” Jordan said. The attorney, former educator and now judicial candidate said failure to address chamber of commerce concerns could draw additional money into the developing opposition campaign, but he said it might not matter. Echols said he has heard a lot of fear around the medical cannabis ballot question, including the employer concerns that Scott and Berry said would be addressed in the proposed regulatory framework. Echols pointed to SQ 788’s language that would place regulation under the embattled Oklahoma State Department of Health. The Oklahoma State Board of Health has authorized OSDH to develop an implementation plan so that the agency will be ready to meet the requirements of SQ 788. Working groups are meeting to ensure that the implementation plan contains all the necessary elements to fully meet the mandates of SQ 788. OSDH will be prepared to carry out the duties as prescribed by law and will provide more information to the public as it becomes available. Scott said the duties prescribed to the OSDH in SQ 788’s language are insufficient. Scott said he and his organization support SQ 788. Echols said he has met with Scott and came away impressed that he knows how medical cannabis programs work across the U.S. Echols emphasized his hope that the Senate agrees to consider Scott’s proposed regulatory framework.